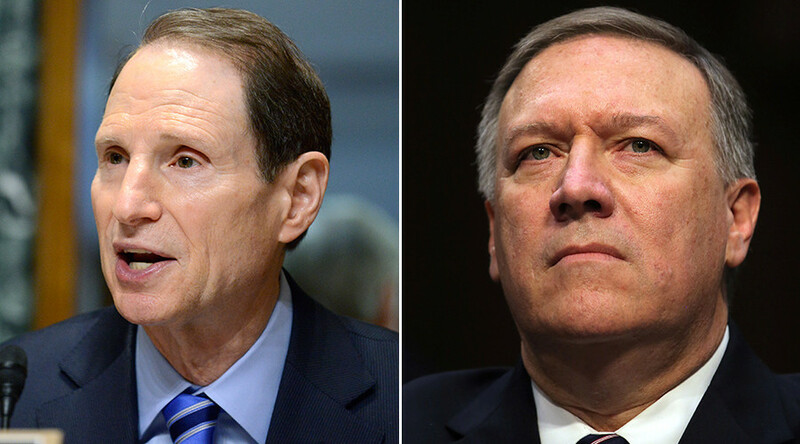 Senator Ron Wyden, a critic of government mass surveillance, challenged CIA director nominee Mike Pompeo on advocating for return to the “metadata collection business,” after those activities were limited by the USA Freedom Act. Senator Wyden (R, Oregon) opened his questions byreferring to an Op-Ed written by CIA director nominee Rep. Mike Pompeo (R, Kentucky) where he advocated for a new law to re-establish the collection of all metadata, including collecting data on the finances and lifestyle data on millions of Americans. Ron Wyden is having none of Mike Pompeo. “When I was talking about the metadata program, I was referring the program that has been changed in fundamental ways by the USA Freedom Act,” said Pompeo, which he said he voted for. Wyden countered that Pompeo wrote the Op-Ed since the passage of the law. “What kind of information would you not enter into?” asked Wyden. The exchange occasionally became tense, with Wyden saying, "Congressman, I don't take a backseat to anyone when it comes to protecting this country." Wyden said he wrote the section on the Freedom Act that gave the government emergency powers and authority to move when its critical to protect the country. “You’re talking about your interest in setting up a whole new database, metadata collections system that is far more sweeping than anything Congress has been looking at,” said Wyden. Pompeo acknowledged Wyden's commitment to national security but shot back, "I take a backseat to no one in protecting Americans' privacy, either." Ron Wyden: you want to create a system that collects all metadata + finances + lifestyle data. Any boundaries? Pompeo didn’t respond further to the question about the new database. Wyden asked Pompeo to submit in writing his views on the limitations of metadata collection. President-elect Trump nominated Pompeo to run the CIA after winning the election in November.